We are a unique entity in this industry, actively engaged in offering a premium quality array of Inspection Rewinding Machine. Our organization is committed to deliver qualitative assortment and therefore, engaged in offering optimum grade spectrum of Inspection Rewinding Machine. Rotational HMI to ease of operation. Aimed at a prosperous growth in this domain, we are instrumental in offering an excellent quality range of Inspection Rewinding Machine. 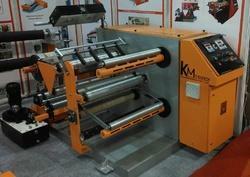 This inspection machine serves as a filter between the Printing & Lamination Process. The output of the printing machine is screened for printing defects such as mis - register, blade lines, shade variation etc. by means of a full width stroboscope provided as standard equipment. Rewinding Diameter: 500 mm on max 76 mm Core I.D. Kalpvrux Converting Product Pvt. 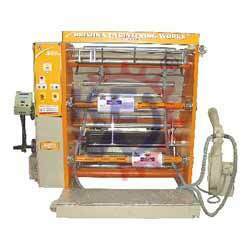 Ltd.
- Shaft less System at Unwinder & Rewinder. - 3 Drive System for Synchronised auto Tension Controller for Unwinder, Rewinder and Main Drive. - Touch Screen System for easy Operating.